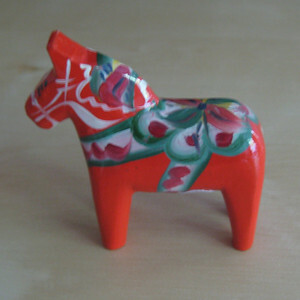 Sweden from the Cheap Seats: Mora or Less; or, "Vasa the matter w' you?" Joe Suddenly it seems that the summer is nearly over, leaving us with a long list of things we meant to do and little time left in which to do them. With that in mind, we set off this past weekend to check one item off our list: a trip on the Inlandsbanan railway through central Sweden. So on Friday morning we got up bright and early (note to self: 8:30 AM only seems an acceptable departure time when one does not remember to consider the two hours of prep and transport that lead up to it…) and hopped a train to Mora, the southern terminus of the railway. Mora is three hours northwest of Uppsala by train, and almost immediately we could tell we were heading into a different area of Sweden. Up until now we've mostly stuck to the coasts—not counting Uppsala itself, but Uppland is sort of an oddly flat and agrarian portion of Sweden. Mora lies in the heart of Dalarna, the Swedish heartland, and true to its name it is a place of valleys, lakes, and rivers. Mora itself lies on the northern shore of Lake Siljan, and it immediately felt a lot like we were in a northern Michigan lake town, with one major thoroughfare right along the lakes edge, and then a more pedestrian-oriented, slightly touristy shopping quarter spreading back from the lake. One thing it was not was peaceful: we had shown up just in time for some sort of classic American car festival, with concommitant speed boat race, and the periodic roaring of the boats in the distance made it sound as though we were being pursued b a particularly annoyed cloud of wasps. Inlandsbanan may have been the reason for our visit, but it is not one of Mora's twin claims to fame, and our first stop in town was inspired by one of these. 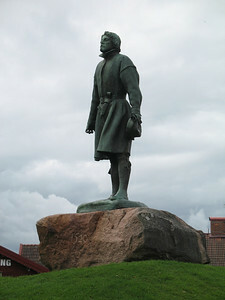 To most Swedes, Mora is with Vasaloppet, which ends in the center of town, under a permanent finish line marker right next to the spot where Gustav Vasa addressed the good people of Mora so long ago (for details see our Vasaloppet post of last year). Jennifer, true member of the proletariat, took one look at Gustav and declared, "Well, he looks like a prat." After taking the requisite photo of Jennifer crossing the finish line (complete with skis, pole, and bib provided by the city for just such an occasion), we headed across the park into the Vasaloppet Museum, where you can learn pretty much everything there is to know about the race while sipping your complimentary cup of hot blueberry soup. My vision of this weekend had been a simple one. We would take the regular train to Mora, camp for a night, then the Inlandsbanan to Östersund where we would camp another night before taking the train home. With cheap transportation, hotels make up most of the expense of a trip like this, and in both cities there are large, well-equipped campgrounds with restrooms and showers available. Unfortunately, the campgrounds in Östersund turned out to be a long bus ride outside of town (with spotty weekend bus service, at best), so my three nights of camping got whittled down to one, and then the weight and bulk of our tent, bags and sleeping pads began to seem somewhat excessive. Especially considering the Inlandsbanan's official luggage policy: we recommend traveling as lightly as possible—which sounds like Swedish code for big bags not allowed. 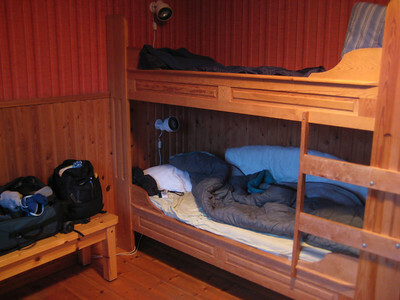 So in the end we wound up getting a room in a Pension in Östersund, and one night in a camping cabin in Mora. It's possible that before the trip I may have grumbled somewhat about our inability to camp, and even gone so far as to price out some lighter weight camping gear, but as I hauled our luggage to the campsite late Friday afternoon amidst light sprinkles I had to admit that I was somewhat pleased not to be setting up a tent just then. 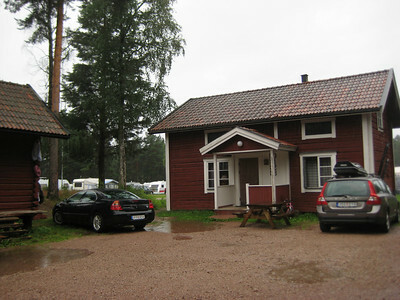 By the time we had settled into our tiny room for the evening with our grocery store dinner, the heavens had completely opened up and the tent field was rapidly coming to resemble a new bay of Lake Siljan, and I was quite happy to sit drily on my bunk and marvel at our foresight. Despite our dry surrounds, though, by morning Jennifer had the makings of a nasty little cold, which was to dog her steps for the rest of the trip (and mine shortly thereafter, but that's another story). Still, the morning was relatively dry and clear (in other words, it was only pouring down rain for the first couple of hours after we woke up), and we were determined to make the most of it. 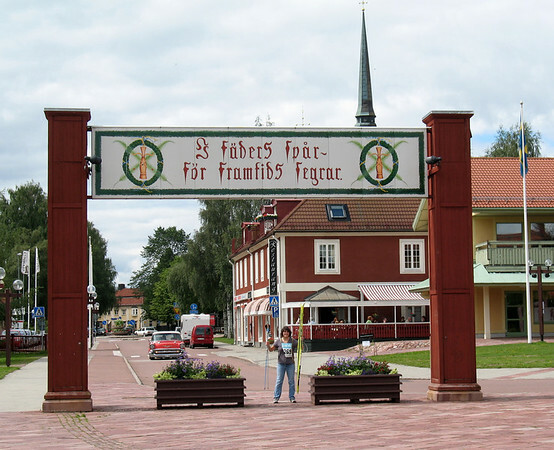 We checked out of our cabin and headed into town, depositing our luggage at the tourist info office for 20 SEK (!) 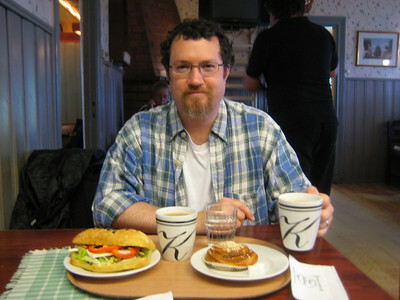 before grabbing breakfast at a coffee place, called Kaffestugga, in Mora's pedestrianized shopping district. Not the most unwelcome cup of coffee I've had in my life. Our train didn't leave until 2, so we had just enough time left to visit Mora's major cultural attraction, the Zorn museum and home. Anders Zorn was born in Mora, and went on to become such a successful artist that he died one of the richest men in Sweden. 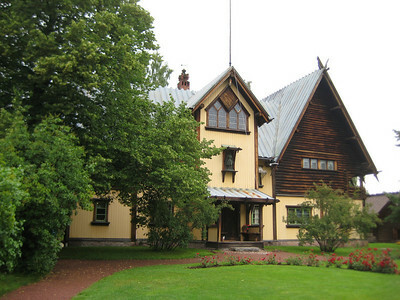 After his wife's death, their home in Mora and all it's contents were donated to the Swedish State, and became the basis for the Zorn museum. We split up for this part: Jennifer checked out the museum of Zorn's work, while I took the tour of the home. The tour was fascinating, I'm sure, from the little bits of it I understood, as it was alas entirely given in Swedish. Nevertheless, tromping around Zorn's turn of the century home with little plastic covers over my shoes was an entertaining way to spend an hour. What did I learn? Zorn had one of the first private telephones in Sweden, and his phone number was 4. He had the best billiards room I've seen, and he liked collecting stuff. Did I mention that the tour was a little hard to follow?